Known as Palace of Winds in English, this building is a complete knock-out with its pink color, intricate design, and over 950 windows. 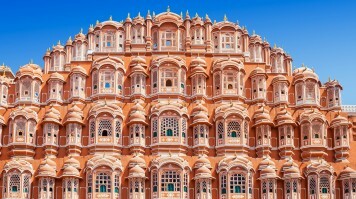 The Hawa Mahal was built in 1799 for one purpose; it served as an observation center for the women of the royal court to look out on the street and people-watch without being seen themselves. 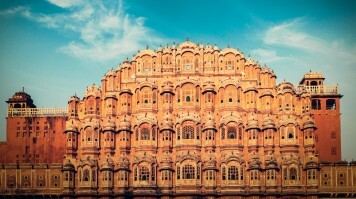 The 5-story palace is one of the most iconic sights in India and one of the top things to do in Jaipur. From the top of the building you’ll also be treated to some great views of Jantar Mantar, the City Palace, and the Sireh Deori Bazaar. Good to know: The entrance fee is less than USD 2* and hours of operation are 9:00 – 16:30, seven days a week. Tip: If you plan to do a lot of sightseeing, consider purchasing a Composite Ticket for USD 14*. 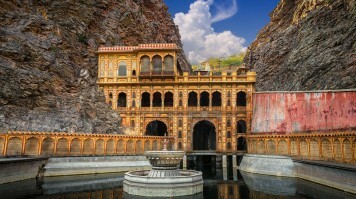 It allows access to 8 popular attractions in Jaipur (4 of which are on this list!) — Hawa Mahal, Jantar Mantar, Amber Fort, Nahargarh Fort, Albert Hall, Sisodia Rani Garden, Vidhyadhar Garden, and Isarlat. 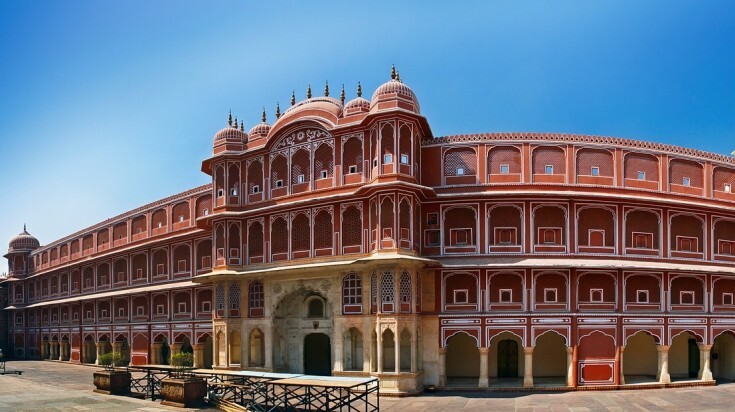 In the center of the historic Old City, the sprawling complex of gardens, courtyards, and royal buildings of the City Palace is one of Jaipur’s main points of interest. It is one of the most impressive examples of Rajasthani and Mughal architecture in India. The Palace has been expanded, improved upon, and changed throughout history, but it was initially constructed between 1729 and 1732. The “Welcome Palace”, the armory, galleries, and grand courtyards are just some of the areas open to visitors. The Chandra Mahal, also on the City Palace grounds, is the current-day residence of the royal family descendants. There is an additional fee to tour this area. Good to know: The City Palace is open every day from 9:00 – 17:00 and the cost is roughly USD 7 for foreigners. 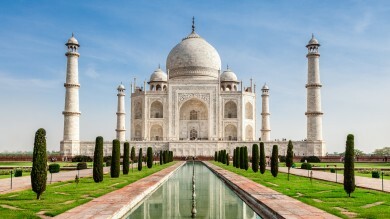 The price to tour the Chandra Mahal is an additional USD 35*. This may seem pricey, but most will stay it’s worth it. This astronomical observatory is one of the city’s most unique attractions and is high on the list of things to see in Jaipur. Built in the 18th century, this structure includes 20 fixed instruments used to measure, calculate, and observe the sky, stars, planets, and other phenomena above us. UNESCO has declared Jantar Mantar a World Heritage site and claims it has the best-preserved set of monumental structures built in India. Some of them are the largest ever built in their categories. Good to know: Jantar Mantar is open daily from 9:00 – 16:30. The admission price is USD 3. The best way to learn about the instruments and each of their functions is to hire a guide which costs an additional USD 3. An audio guide will cost around USD 1.50*. Located less than 10 miles outside the center of Jaipur, one of India’s crown jewels sits atop a high hill overlooking Maota Lake. This fort is actually located in the small, 4 sq. kilometer town of Amber (the ancient capital), but it’s one of the main things to see in the Jaipur area. Made from red sandstone and marble, the Amber Fort is a sprawling complex known for its Rajput (Hindu) and Mughal (Islamic) style architecture. It’s composed of many courtyards, halls, gardens, gates, and cobbled paths. 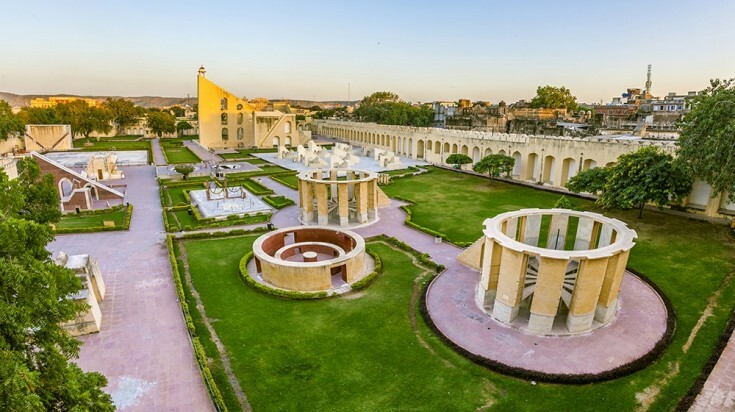 Constructed in the 16th century, this fort (or “palace” as it’s sometimes referred to as) was the residence of the Rajput rulers as well as a defense system for the city. 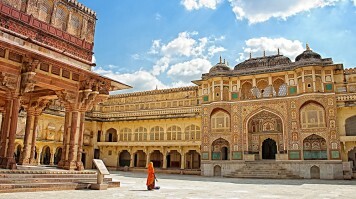 Amber Fort is a UNESCO World Heritage Site and is part of the 6 group hill forts in Rajasthan. Good to know: Amber Fort is accessible by public bus leaving from Hawa Mahal (the cheapest option), rickshaw, or taxi. The fort is open 7 days a week from 8:00 – 17:30. Entrance costs USD 7*. 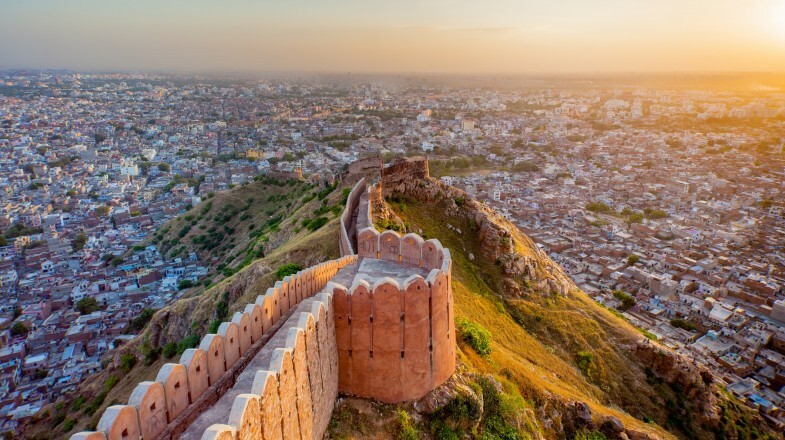 Together with the above-mentioned Amber Fort and neighboring Jaigharh Fort, the Nahargarh Fort helped defend the ancient capital from its perch on the Aravalli Hills. 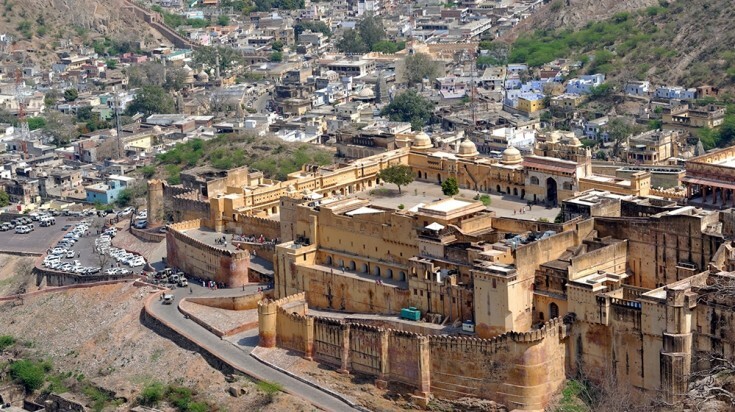 This fort served as a retreat for the royals and is known for its breathtaking views of the city below. Nahargarh Fort is connected via wall to another prominent building, the Jaigarh Fort. Inside the two-story structure, visitors can tour the many private bedrooms, lobbies, bathrooms, and multiple temples. Good to know: Opening times are 10:00 – 17:30. Admission fee is USD 3*. Visit at sunset for the most spectacular views! There’s no shortage of bangles, bobbles, and bits in this Indian city. Jaipur is famed for its bazaars. If you’re souvenir shopping or looking for jewelry, textiles, clothes, or pottery, you should definitely schedule a day to browse Jaipur’s shopping district in the Old City. Most of the biggest and best markets are located within a 2km radius. Johari Bazaar is known for its gold and silver, as well as inexpensive costume jewelry and other glittery bangles. Tripolia Bazaar, just a few hundred meters from Johari, specializes in lac jewelry and fabrics with beautiful embroideries. Chandpole Bazaar is good for marble carvings and handicrafts and Kishanpole is the best for wooden carvings. Good to know: Visit the markets in the early morning. Vendors want to start their day out on a positive note and will be more eager to sell. This is the best time for bargaining and for beating the crowds! Known locally as Galta Ji, this large Hindu temple complex is a hit with foreign visitors. The highlight here is definitely the uninhibited colony of Macaque and Rhesus monkeys that call this temple home. The spunky primates aren’t the only unique thing about Galta Ji. The structure was built atop a natural spring which fills the complex’s 7 pools. 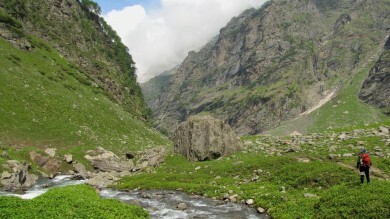 These waters are considered holy and are a place Hindus come to wash away their sins. 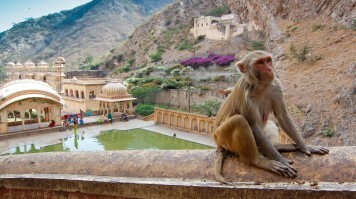 The monkeys are also known to splash around in these waters — definitely a desirable thing to see in Jaipur! Friendly warning: these monkeys are not shy, so be prepared to share your personal space and even make contact with your new furry friends. Good to know: Monkey Temple is slightly off the tourist track, therefore there isn’t any public transportation from Jaipur to the temple. You can either hire a taxi or a rickshaw to take you there, wait while you explore, and then return you to Jaipur. The cost of a taxi can be anywhere between USD 7 – 9 and the rickshaw (always cheaper) between USD 3 – 4*. Located on the outskirts of Jaipur, visiting this authentic village is a way to break free from the typical tourist track and see an authentic side of Jaipur. Many village suburbs are the source of the ample selection of handicrafts found in Jaipur’s bazaars. Rusirani village is no exception and a great choice if you’re craving an escape from the city noise and congestion. A walk around Rusirani is like walking back in time. You’ll see the villagers happily living their lives without electricity, internet, or telephones. Authentic handicrafts and art work are produced here and can be bought straight from the creators themselves and at a cheaper price than you’d find in Jaipur bazaars. It’s also a very scenic place with bright green fields and ancient temples dotting the landscape. Good to know: Rusirani village is roughly 100 kilometers outside Jaipur in the Aravalli Hills. Hiring a driver/car, rickshaw, or a taxi are the transportation options. This popular and traditional drink is loved throughout India by locals and tourists. The yogurt-based drink is usually enjoyed at lunch time and comes in two variants; sweet or salty. The salty Lassi is blended with spices and water while the sweet Lassi calls for sugar and fruit. India’s intense heat makes a chilled Lassi on a scorching day extra refreshing. They can be found everywhere, from markets, cafes, and restaurants. They are typically very cheap – a price of less than USD 1* is the norm. Good to know: Head to the iconic “Lassiwala” shop (nearby to the Old City area) to sip on some of the city’s most praised Lassi! This reconstructed village aims to show tourists what an authentic Rajasthan village was really like thousands of years ago. Marketed as a model miniature rural village, Chokhi Dhani is a one-stop destination for everything the city of Jaipur has to offer. Tourists can come to enjoy ethnic dances, music, shopping, art galleries, and festivals. Other entertainment includes camel rides, puppet shows, fortune tellers, acrobats, and magic shows. The food here is delicious and authentic, so come hungry and eat like a King. Chokhi Dhani also provides top-quality on-site accommodation for those who wish to stay and play. Good to know: Located 12 kilometers outside the center of Jaipur, a hired cab is the only way to reach Chokhi Dhani. Cab prices start at USD 14* for a round trip. Ancient villages call the history buffs, the bazaars appeal to the shopaholics, the temples beckon the worshippers, and the stunning architecture attracts everyone else. There’s literally nowhere you can turn and be faced with something ordinary in Jaipur. Whether you’re exploring the Old City or venturing a little further outside the walls to the rural villages, Jaipur’s forts, shrines, markets, food, drink, and culture will not disappoint.